Info "Defend yourself with your shield." The Legend of Zelda is one of 9-Volt's microgames in WarioWare: Twisted! It is set in the NES game of the same name. 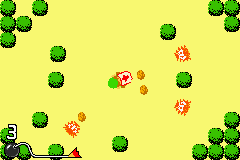 The object is to use Link's shield to deflect attacks by the Red Octoroks. Level 1: Two Octoroks will shoot. Level 2: Three Octoroks will shoot. Level 3: A large group of Octoroks will be present, but only a few will shoot. This page was last edited on November 17, 2018, at 03:36.